When did the New York-based performance artist become such a cornball merchant? 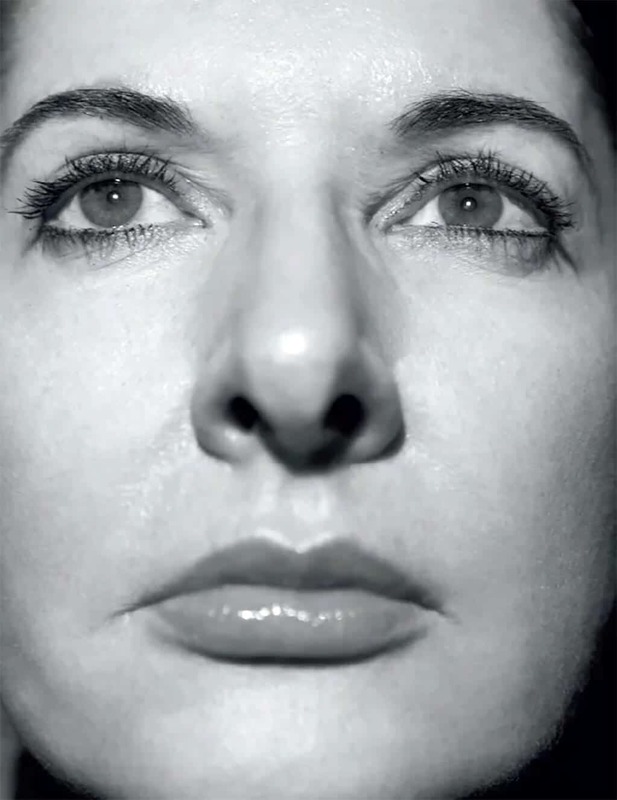 I’ll admit, there’s a scene that made me well up during the excellent Marina Abramović biopic The Artist is Present. If you’ve seen it you’ll know the scene I mean – it’s where Ulay, Abramović’s former partner, in art and in life, takes the seat opposite her on the last day of her marathon MoMA performance. And the tears come, hers and his and then ours, and she takes his hands, and then more tears. Oh god. Abramović and Ulay did some powerful work in the Seventies. As a couple they gave expression, in a highly wrought, often florid fashion, to the psychological violence that often bubbles under the surface of relationships. It was raw, it felt “real”. When they parted, they ritualised their separation in a highly resonant performance that involved walking from opposite ends of the Great Wall of China, Ulay starting from the Gobi Desert, Abramović from the Yellow Sea, and eventually meeting in the middle – having each walked 2,500km – to say goodbye. They then continued on their separate journeys. So though she’s not quite the “grandmother” of performance art, as Yoko Ono was doing seminal performances such as Cut Piece back in the mid-Sixties, we must give her her dues. The focus and commitment that drives her work is phenomenal. And the huge emotional gestures, the wrought, often extreme nature of her work (and often the striking naivety of it, too, with one performance inviting participants to do as they wished to her naked and prone body with the 72 objects placed nearby, including a pistol and a bullet), have continued to exert a visceral power. Though the situations she created were not always contained within physically safe boundaries, the controlled histrionics of the work largely were, though certainly not always. But that was then. Now we have the artist simply being. From tomorrow, visitors to the Serpentine will queue, possibly for hours, to touch the cloth, as it were, or at least look into the eyes of celebrity, since it’s the aura of celebrity invested in the charismatic person of the artist that will focus the attention and exert its power. That Abramović believes, or at least asserts, that she has reduced her work to some kind of primal state – where money, status and all the other fripperies peripheral to the business of actually making art have been removed – reveals a lack of insight, since the exact opposite is the case. Everything has indeed been stripped away but the aura of celebrity that visitors are being invited to commune with. Where once she explored universal themes, now the focus is simply on her presence. Contrary to promising to be the most “radical” thing she’s ever done, 512 Hours will surely be the most banal, however intimately or intensely some individuals may experience it. And it’s all being emptily bolstered by a lot of New Age blather, which is near-messianic in its level of self-belief. Through her presence Abramović wants, she tells us, to “change the consciousness of the world,” and she endlessly litters her conversation with the word “energy” (as in psychic, telepathic “energy”). “I feel very humbled,” she says more than once, a statement you can rely on to always mean its opposite. She says she’s well aware of British “cynicism”, thereby misunderstanding scepticism for something else entirely. I happen to value British scepticism, though I don’t think the British have exclusive rights to it. Critics have revolted against Abramović’s cheesy grandiosity in New York, too. The extended press conference yesterday, at which the artist was present, made me squirm. In the middle of it Abramović picked out members of the audience, taking each one by the hand, placing her hand between their shoulder blades to transmit “energy”, before leaving them facing a gallery wall for 10 minutes. Nobody cried, but a few were irritated. In any case, making people cry, emote, reach out to touch you because they feel overwhelmed by your royal presence, can make crap art. And during 512 Hours visitors will be asked to sign a disclaimer since they’ll be filmed (Abramović will wear a tiny camera about her person). What a spectacle of emoting we’re promised. Maybe she’s hoping to be our new Queen of Hearts. So when did Marina Abramović become such a cornball merchant? The answer might be, “Perhaps she was always a bit prone, but she had someone to rein her in.” There’s a clue in The Artist is Present, and it’s the scene where she’s discussing, with her New York gallerist Sean Kelly, a possible collaboration with the celebrity magician David Blaine, a collaboration that promises to be all smoke, bells and whistles and more. She’s more than keen to do it, but, knowing that it has the potential to damage her brand as a serious artist, Kelly tells her not to. “This is not what you’re about,” he says. And, wisely, she listens. If she’s now only listening to the yes men, and women, who are all busy simpering how wonderful she is, then that’s a great shame. This isn’t a review, since I haven’t actually experienced any of 512 Hours as it unfolds, nor have any members of the press. We’ll have to wait, like everyone else, for the doors to open to the public. And it goes without saying that each interaction with the artist will be a unique and subjective experience. You might cry. You might laugh. You might feel bashful. You might feel irritated. But you might do and feel all those things when you see your gynaecologist. This makes neither your gynaecologist a great artist, nor your last smear test a great work of art.